The among very first lessons in drafting is measuring. Measuring matters. Measuring is everything. If your measurements are off, then everything based on that measurement will be off as well. The first action of every drawing is to true up your t-square and establish a baseline. Truing up a -t-square means making sure that it's well seated against the board, delivering you a reliable line. From that point, you can slide your square up and down the board and always get a parallel line to the baseline. If any line seems off further into the drawing, the baseline is correct. You need a baseline because you can't guarantee that any other line or reference point is accurate. Even the paper can be cut wrong. The baseline, in that way, is totally arbitrary, but it's well understood arbitrary. It does what you want, which is to give you a reliable reference. From there, you draw lines and measure. The thing about drawing lines is that in drafting, you can flip your ruler around any way that you want and measure a length with high precision. Measuring lines is easy. This is important to note when you are simulating art deco designs in a vector based software. In that software, you need to think about how you are going to measure an item so that it comes out to the right size. In this drawing, I began with a 2-inch square rotated 45-degrees. I then created two additional squares from that, one where I measured out one inch along the side of the square, and the other where I measured out one inch from the vertical. Do you see the difference? These drawing have different proportions based entirely how I determined where to place my one inch increment. 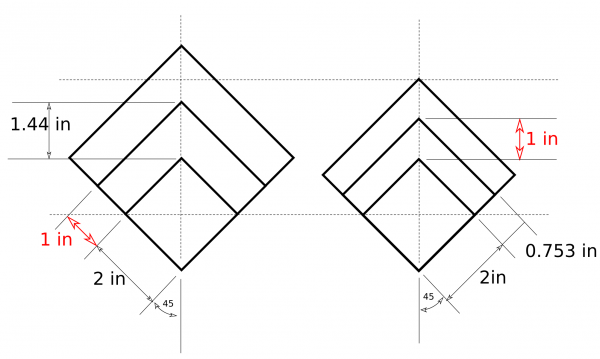 When recreating art deco, pay attention to how the original draftsman measured. If you can match his measurements, you'll have a far easier time getting the proportions correct. Of the above, which is correct? Well, the one on the right seems nice to the eye, but the one on the left is easier to construct for a known bounded space. They're each right, but used to different effect. If you can determine the original measurement system, you'll help yourself immensely. Use Imperial measure for the English world (these divide into 4ths and 8ths easily), while you should use metric for elsewhere (as these divide into fifths and tenths more easily).